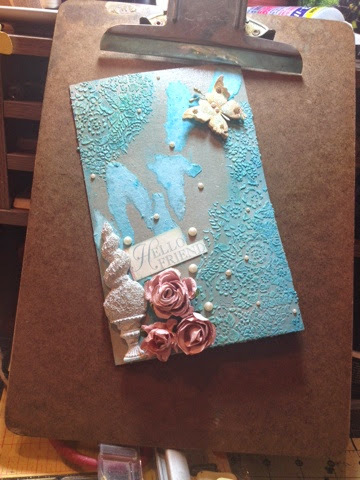 Eclectic Paperie: Embossing paste, grunge board and pan pastels! Oh my!!! 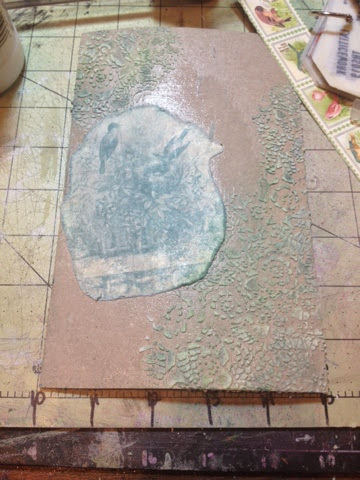 Embossing paste, grunge board and pan pastels! Oh my!!! Hi there! It's Erin here with you today with a quick little project that I created to showcase some different products that came out a whole ago, but they got buried under all the new and cool stuff! We're bringing back the end and splashing it up with a bit of the new! This is the entire project. 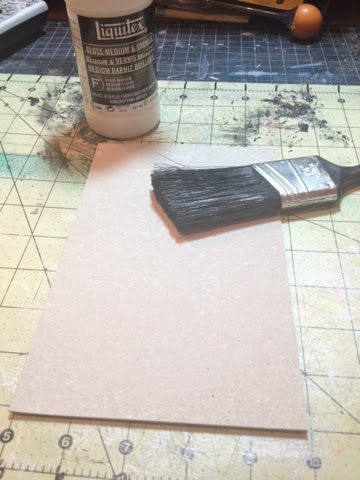 I took the Liquitex acrylic gloss fluid medium and painted a thin coat over the grunge board. 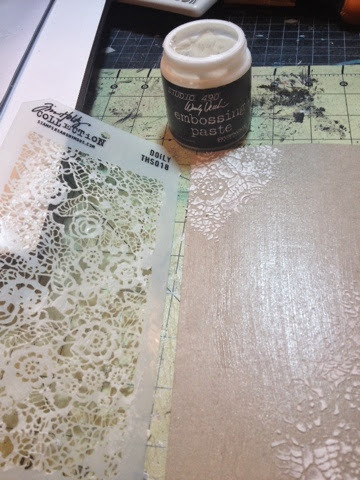 I let it dry and then want to town with Tim Holtz's new lace stencil and Wendy Vecchi's white embossing paste! That stuff is the bomb!!!!! LOVE IT!!!!! There's substance in it and it doesn't fall apart on you or act like you're working with jello. Then I added some teal and lime green pan pastels (I'm sure they have real names, but at the moment, their names escape me! ); and just sponged it on with the large makeup looking sponge. I did add paper from G45's Botanical Garden, but then I sprayed the whole thing with my 3 Blue Dylusions sprays, and it turned incomprehensible. I tried to peel it off and it left a cool rip, so that became part of the background! 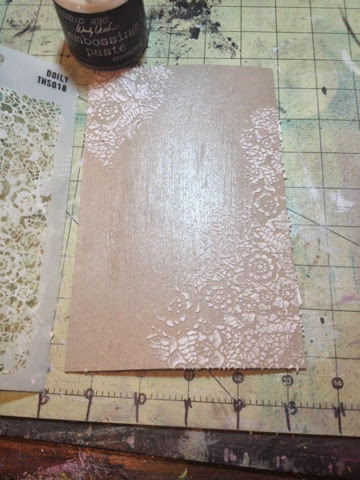 I sprayed the large lace section on the right with White Linen Dylusions spray and then patted it dry with a paper towel. It acted almost like water because it cleared up a lot of the blues and cleaned it up! It was a little too messy!!! This is the finished product! I apologize for the grossness of my pictures! I am waiting for my computer to be fixed and returned! So for now, I have no photo editing on my phone!!! But, I'm a huge flower and embellishment hoarder! So I used a couple flowers and resin pieces and a butterfly from my stash to dress it up! I hope that you have a wonderful day!!! 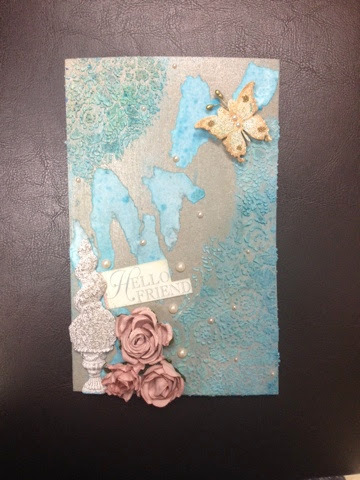 What wonderful texture on this Erin - with the paste, flowers and pieces! The blue is beautiful! You did a great job on this. Love the texture. And your resin embellishment and flowers blend it all together so pretty. 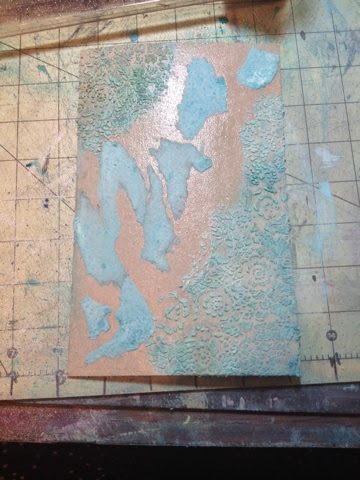 Oooooh lovin' that translucent embossing paste. Gorgeous peace girl!!! How cool it turned out Erin, I even love the torn bits of paper..love it! Beautiful! I love all the texture. Love the crazy fun mistakes and the brown and blue combo.